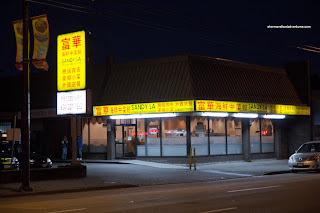 Not too long ago, I was driving down Victoria Drive and noticed that Nancy Wonton House had closed up shop. In fact, renovations were taking place for a new restaurant. The new place bore the name of another female - Sandy La. Okay, I'm not really sure it is named after anyone at all, but it does make one wonder what happened to good ol' Nancy... Let's not speculate. LOL... So the good news is that place retained its late night hours which really suits our hockey team just fine. I'll say it and say it again - for such a large city, Vancouver sure doesn't have a great selection of late ni ght eats. Actually, we only had a small group consisting of Myself, Milhouse, Emilicious and Sweet Tooth for eats this time around. But that didn't stop us from ordering 6 dishes from their "da lang" menu (or Chinese late night). Hey, we figured from the small portions we've received from other da lang joints, 6 would be just enough. 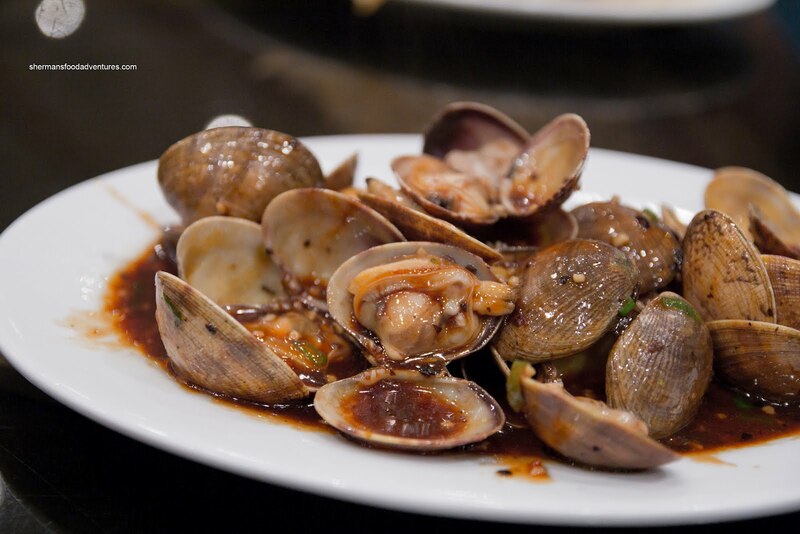 The first dish to arrive was the Black Bean Clams. The clams were plump and cooked nicely with only one not open. There was just enough black bean sauce to flavour the dish. The sauce was salty enough and garlicky. 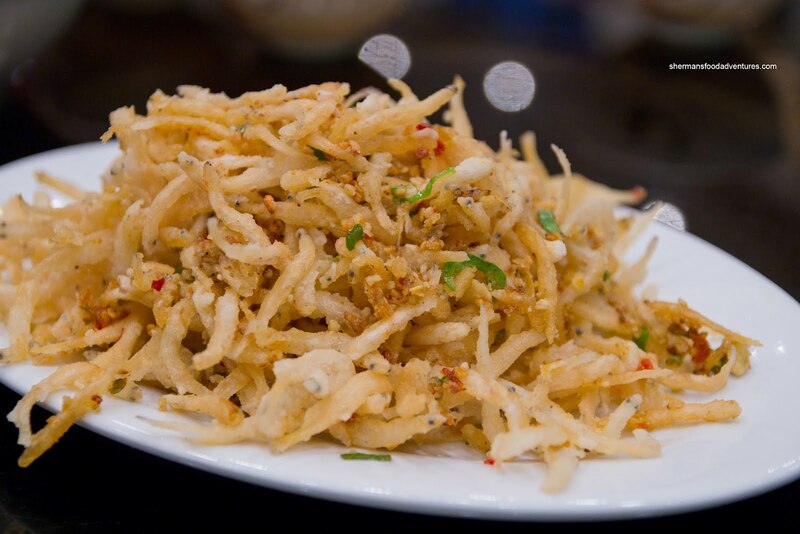 The classic da lang dish, Fried Silverfish, arrived in a heaping mound. This was a sign to come as to the portion size. Now, for those who are alarmed at us eating silverfish, don't worry. These are not the same crawly things found in your kitchen. Rather, they are little fish that are battered and fried, then wok-tossed with salt, chilis and garlic. This particular dish was executed beautifully. The fish were crispy and flavourful, going really well with the plain congee. 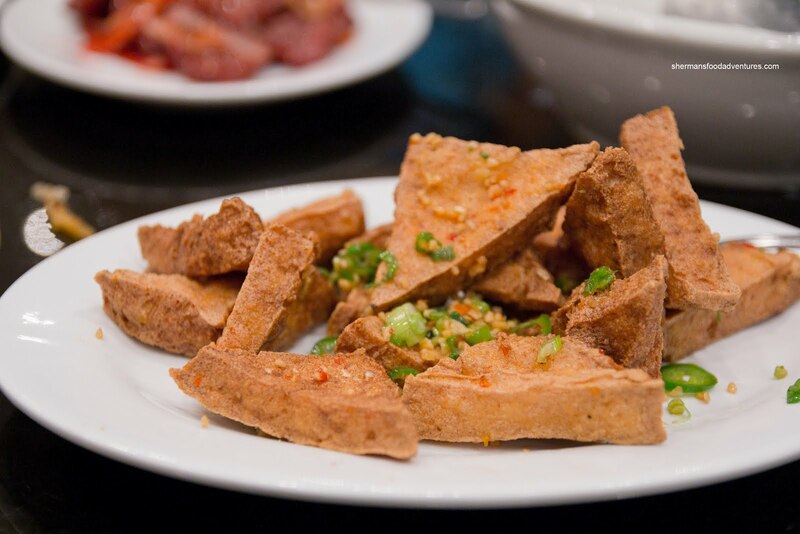 With similar seasonings and preparation, the Fried Tofu was somewhat less successful. The tofu itself was fried nicely being crisp on the outside while retaining some tofuness on the inside. However, the wok-toss seemed to be lacking as the pieces of tofu were tasteless. 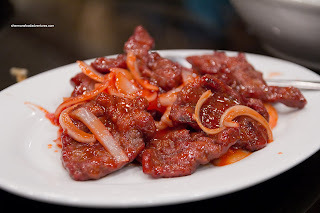 For our meat dish, we had the Chinese-Style Beef Tenderloin. Now let's get real here - rarely do we ever see actual beef tenderloin used in this dish, even at higher-end Chinese restaurants. Rather, it could be any cut of meat that has been pounded and tenderized (baking soda). Well, this one could've used a bit more tenderizing in a few pieces as they were quite chewy in the middle. With that being said, most of the other pieces were tender and just cooked. The proper amount of sauce clung onto each piece affording them with a sweet, slightly tart flavouring. Continuing on the sweet n' sour theme, we had the Sweet & Sour Fish which arrived in a radioactive red tinge. The fish, which I believed to be Basa, was in large pieces. This probably helped in keeping it moist and flaky. The sauce itself was mostly sweet with only a hint of tartness. 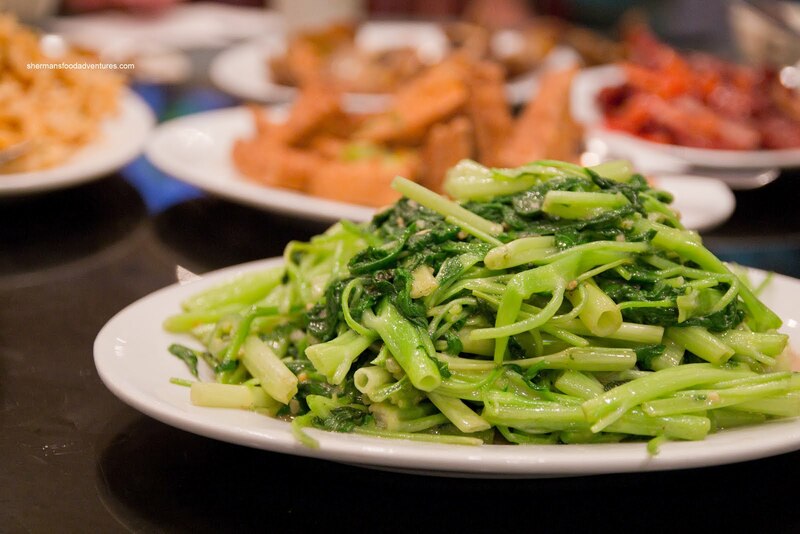 Lastly, we got some veggies in the form of Tong Choy (or water spinach) stir-fried in the usual fermented tofu. Yes, it doesn't sound all that appealing, but the two ingredients seem to go hand-in-hand. Again, this was a healthy portion which featured nicely cooked tong choy (which was still crunchy). 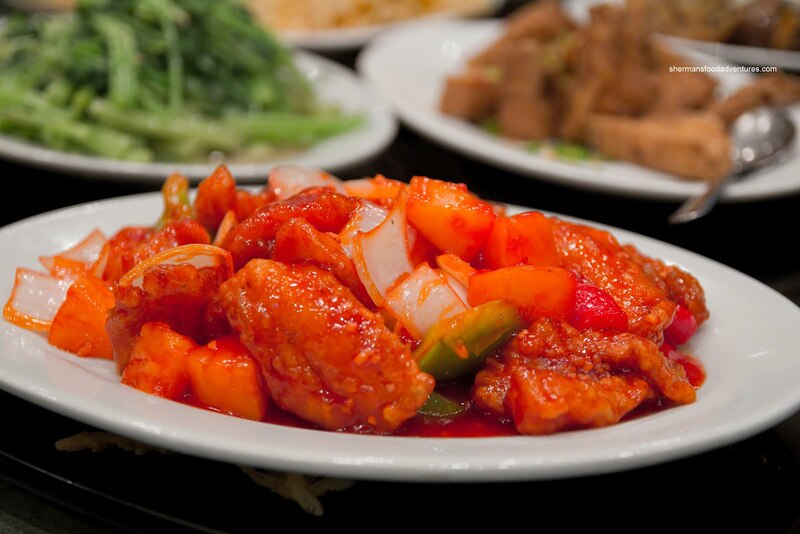 Despite the appearance of enough fermented tofu, the whole dish lacked enough impact. Now impact in flavour was one thing, but portion size is another. Although these dishes were part of the late-night "smaller" size menu, they were plenty big. We had more than enough for the 4 of us and the prices were reasonable. Sure, not everything was perfect, but as I say over and over again, nothing is (especially when dealing with a restaurant kitchen where there are many variables). The food was more than acceptable. The service was "okay". It is rare to experience "warm & fuzzy" service at Asian restaurants anyways. It was sparse though as we had some trouble flagging servers down. At the very least, the experience was decent enough for us to consider returning to try their noodles and congee. I did wonder what happened to Nancy. Maybe Sandy's her sister and their sibling rivalry got the worst out of Sandy, LOL. Or maybe this Sandy is related to the one who owned, and re-located, the original Golden Phoenix on Nanaimo St. Who knows. I did notice a sign on SL's door saying they're only open from 5pm to 3am. So dinners and late-nite ""da-lang" only ? @LR Definitely only dinner and late night. There are quite a few that do that like Always and Kwan Luck. Guess the staff needs to sleep in from the late nights.